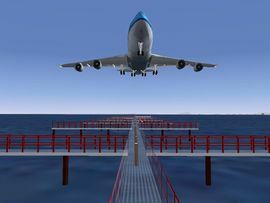 San Francisco International Airport (often abreviated to as SFO or KSFO) is FlightGear's main airport, and therefore included in the base package. It has a range of custom scenery building models including Alcatraz, downtown San Fransisco, and the Golden Gate Bridge. Because of the large amount of multiplayer traffic around SFO, some systems might crash (or extremely lag) when launched at SFO or a nearby airport. SFO has four runways. The runways are positioned parallel in two pairs. Two of them are north-south, two are east-west. The separation between parallel runways is 750ft. While simultaneous landings can take place on parallel runways in good weather, Federal Aviation Authority (FAA) rules for landing aircraft restrict the airport to one runway in bad weather which can lead to increased delays. The following runway configurations are prefered (from left to right), if weather permitting. Runway 01R-19L is 2636 meters long. The 19L end is equipped with ILS, with 108.9 used as the navigation frequency. Runway 01L-19R is 2286 meters long, therefore the smallest runway of the airport. Runway 10R-28L is 3231 meters long. When the 28 runways are in use, 28L is normally used for takeoffs. The 28L end is equipped with ILS, with 109.55 used as the navigation frequency. This runway can, and sometimes is used for, landings due to the dominant wind direction pushing against it, though it is normally only used for landings in simultaneous landings or if 28R is busy, otherwise takeoffs is its preferred use. Runway 28R-10L is the airports longest runway, with 3618 meters. When the 28 runways are in use, 28R is normally used for landings. When approaching 28R, the localizer 111.7 can be used to direct the pilot for ILS. This is automatically programmed into the NAV1 frequency in the backup spot, and can easily be switched in for use. This page was last modified on 1 February 2013, at 20:26.